Robots: How long before they're part of the family? Dr Feras Dayoub and his Adept Guiabot - the makings of our home helper of the future - will feature at Robotronica at QUT on August 18. Low-cost, high-performance sensors, such as digital cameras, and advances in computer vision and artificial intelligence are bringing the age of robots ever closer, says QUT robotics scientist Dr Feras Dayoub. 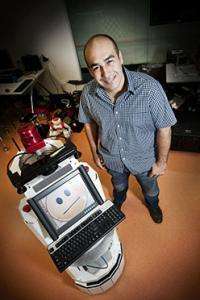 Dr Dayoub said robots such as the Merry Porter mobile robot had already been designed to perform routine delivery tasks in hospitals while others, such as the cuddly seal-like Paro, were being used therapeutically. "But potentially robots will play a much wider role in our society," he said. "Functional and useful mobile service robots will have to be able to share physical spaces with humans and deal with a dynamic and ever-changing world. "They will need to have a map and adapt to changes in the arrangement of objects and the appearance of the environment, changes that may be spontaneous, discontinuous and unpredictable, as a result of human activities." Dr Dayoub is using an Adept Guiabot mobile robot to develop methods which enable a mobile robot to navigate through a changing environment, such as a family home. "In a home, furniture will be moved, visitors will come and go, not much will stay exactly the same from day to day and robots will need to learn how to adapt to this dynamic setting." The Adept Guiabot will be demonstrated at Robotronica, a free robot spectacular being held at QUT's Gardens Point Campus on Sunday, August 18. Robotronica will see world-leading robots from Europe and Japan come to QUT for a free public event designed to encourage people to learn about and interact with robots from the controversial life-like variety to the downright cute. Dr Dayoub said a robot would be a lifetime investment for a family and for many that robot would be seen as part of their family. "The main aim of any technology is to make life easier," he said. "One day robots will help the elderly and disabled live a normal life in their own homes without having to have a full-time human helper. In that way a robot will give them freedom. "It is highly likely that robots will one day be able to perform duties such as those of a tour guide, receptionist, and even a night watchman or a fire fighter." Dr Dayoub and PhD student Timothy Morris are undertaking an Australian Research Council-funded project ($500,000) titled "Lifelong robotic navigation using visual perception" under leadership of QUT Professors Peter Corke and Gordon Wyeth and in collaboration with researchers in Oxford University, UK. "As humans we can see our environment and navigate our way through it, but robots need to be fitted with cameras and multiple sensors to enable them to sense their environment," Dr Dayoub. "While it's possible to program a robot to do certain tasks and navigate through a repetitive, structured environment, such as corridors, it is a completely different thing to create a robot that can sense and adapt to a changing environment, such as a home? "However as many researchers around the world are working on the same topic, our collaboration is global. "Every time a scientist publishes a paper on their research, it adds to the collective pool of knowledge. "While we are working on the navigational aspects of robotic research, researchers elsewhere are concentrating on how to make robotic arms work while yet others are working on communication/interactions between robots and humans. "Eventually, we will have perfected all the parts that will make up an effective robot." But he said there was a range of social issues to consider alongside the technical ones. "How will robots be monitored? How will they deal with an emergency? How will people react to robots? With their cameras and sensors they will have the capacity to record everything. "There are multiple levels of complication surrounding robotic research and the technology to advance the research is improving all the time. We will get there eventually."